Order within the next... 5 hours, 47 minutes, 39 seconds ...for dispatch today! The Civil war in China was caused …... as most wars are …... over a difference of opinion between two parties. The Chinese Communist Party (CCP) and the Nationalist Kuomintang (KMT) were each fighting for their place as the legitimate government of China. In a bid to restore control over China, this war formed two parts. It started in 1927, was then separated by the Sino-Japanese war in 1937 and resumed after the war with Japan was over, in 1946. 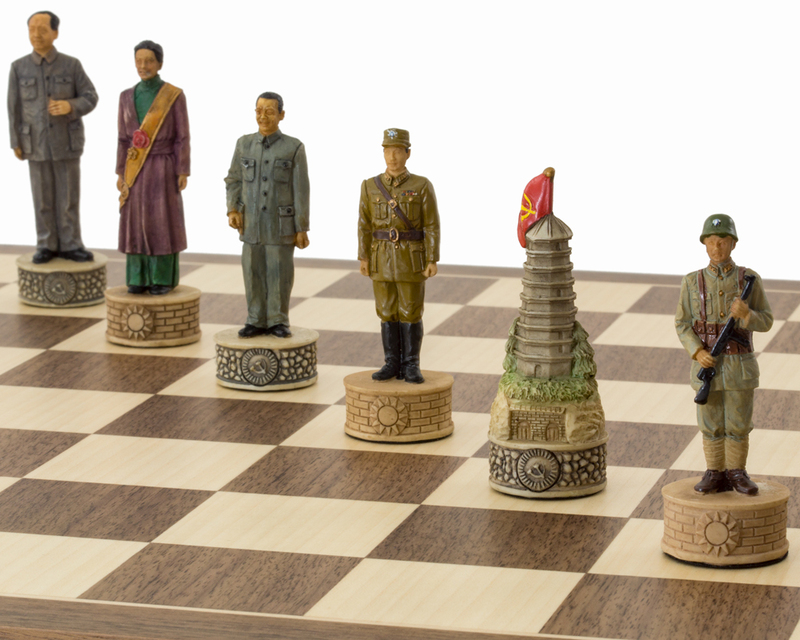 A notable historian claims the Communists won this war due to them making fewer military mistakes than Chiang Kai-shek. In his quest for central and powerful government, Chiang antagonised too many groups in China. 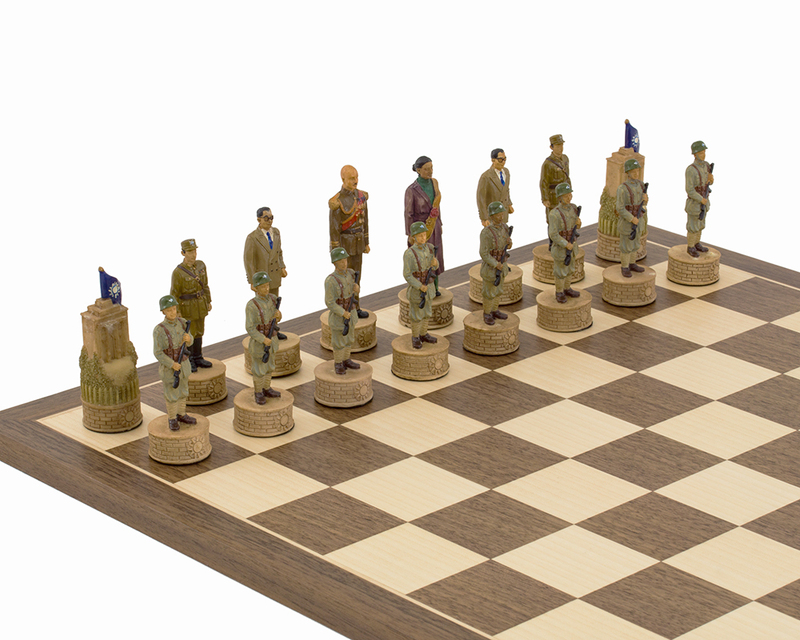 As with all the Italfama hand painted chess men, these pieces are incredibly detailed, bringing any chess board and game to life. 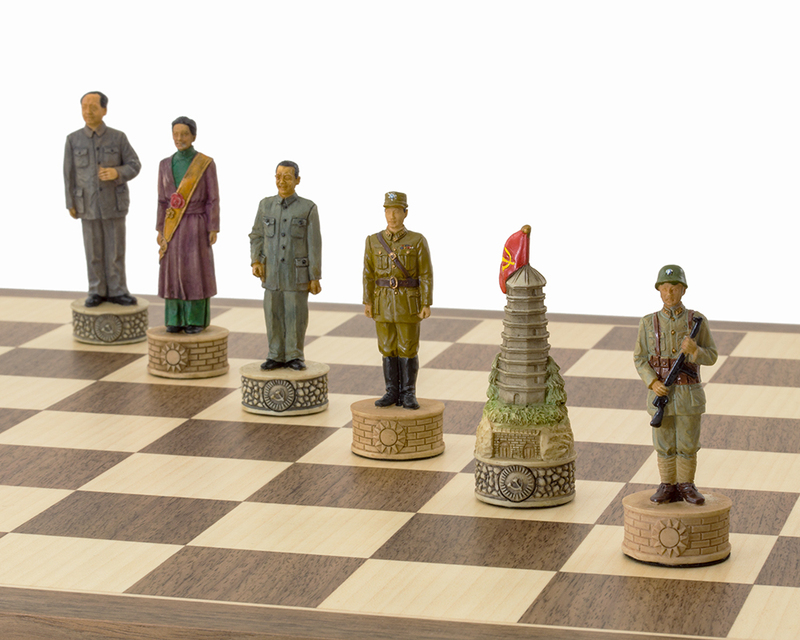 This set, along with its associated pieces, is also known as the Nationalists vs The Communists Chess Set/Men. The Nationalists are lead by Chiang Kai-shek, splendid in full military regalia. Prominent in both the military and politics, he served as the leader of the Republic of China between 1928 and 1975. Supported by his wife, the First Lady of China, Soong Mei-Ling, she was, in her own right, active in the civic life of her country and held many honorary and active positions. His right hand man, in the form of the bishop, would appear to be Soong Tse-Ven dressed in his suit and complete with his round glasses. 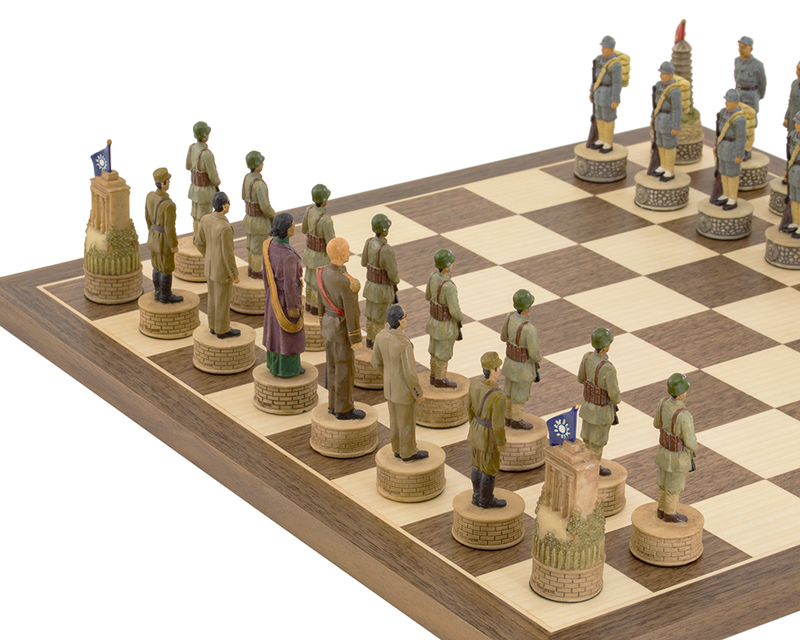 The knight is represented by a military officer with armed infantry backing him up as the pawns. It is the rook, however, that is splendid as the Nationalists Headquarters building in Nanjing. This building has housed the Office of the President of the Republic of China since 1927 until relocation of the Republic to Taiwan in 1949. It is now a museum. None other than Chairman Mao (Mao Tse Tung) could be the leader of the Communists and his figure bears a remarkable resemblance to the man himself. His Queen is Mao’s 4th wife, Jiang Quing, who was one of the most powerful and controversial figures in China during Mao's last years. 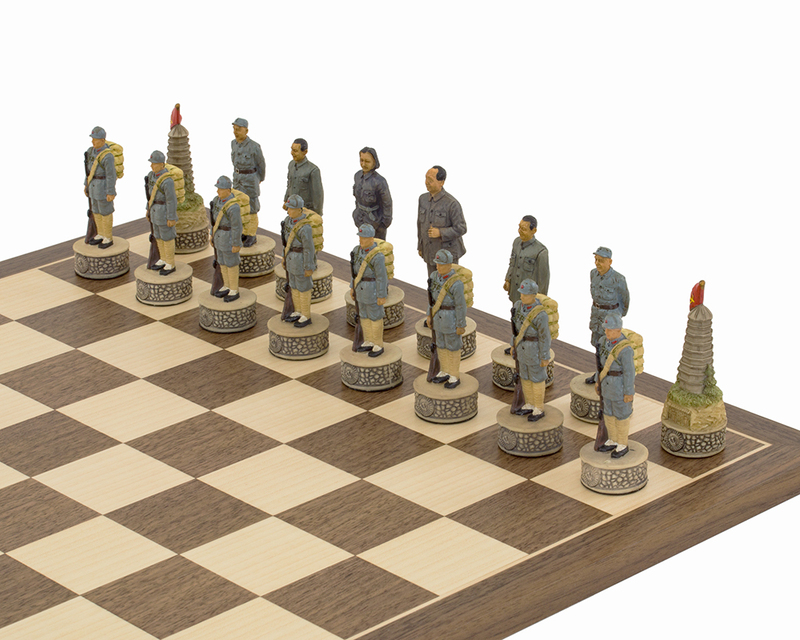 We suspect the knight is based on Lin Biao who was Chairman Mao’s right hand man and the bishop could well be Chen Yun who was considered to be one of the major political leaders of China both during and after the Chinese Civil War. He was also a member of the Eight Elders. 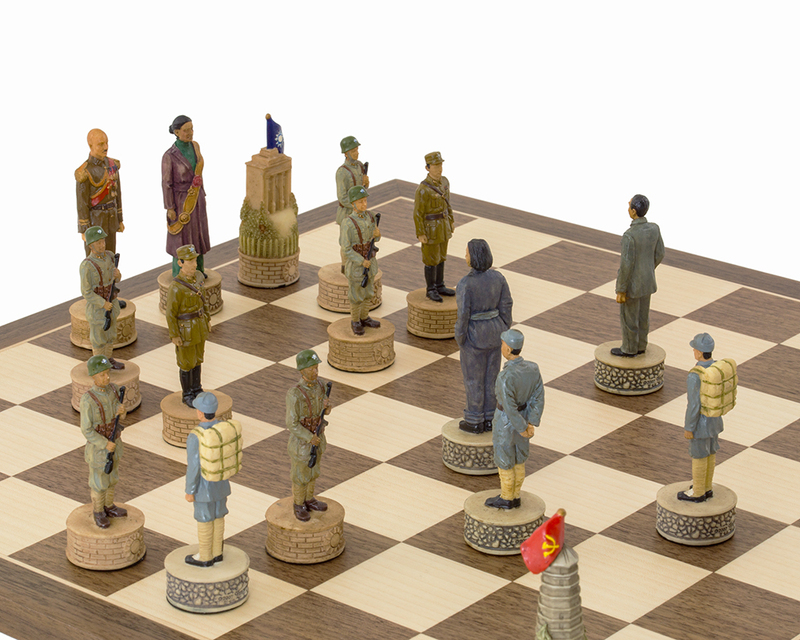 The rook is a tall pagoda style building bearing a flag with the pawns as smartly dressed soldiers carrying a heavy backpack and rifle. 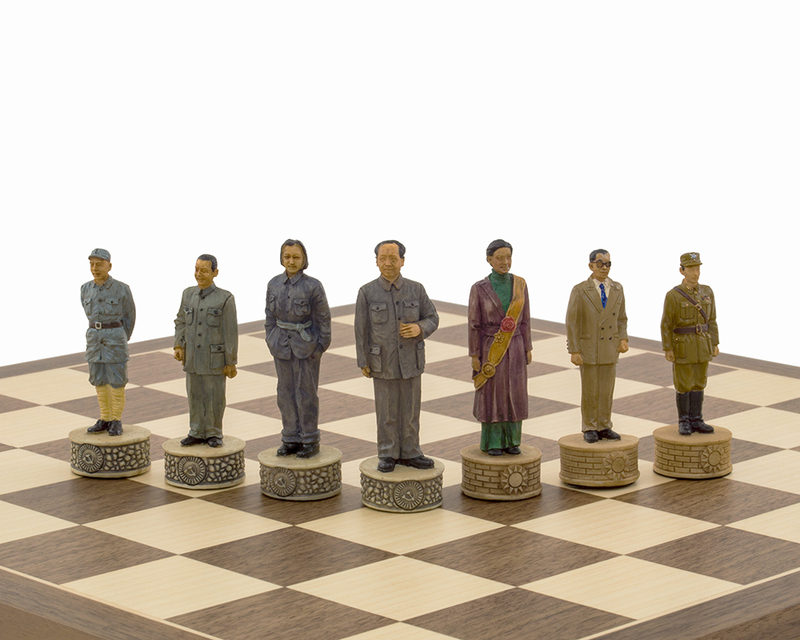 We have matched them with our 15.75 inch walnut and maple board to give you this historical set however theThe Mao Tse Tung Handpainted Chess Men are also available on their own. 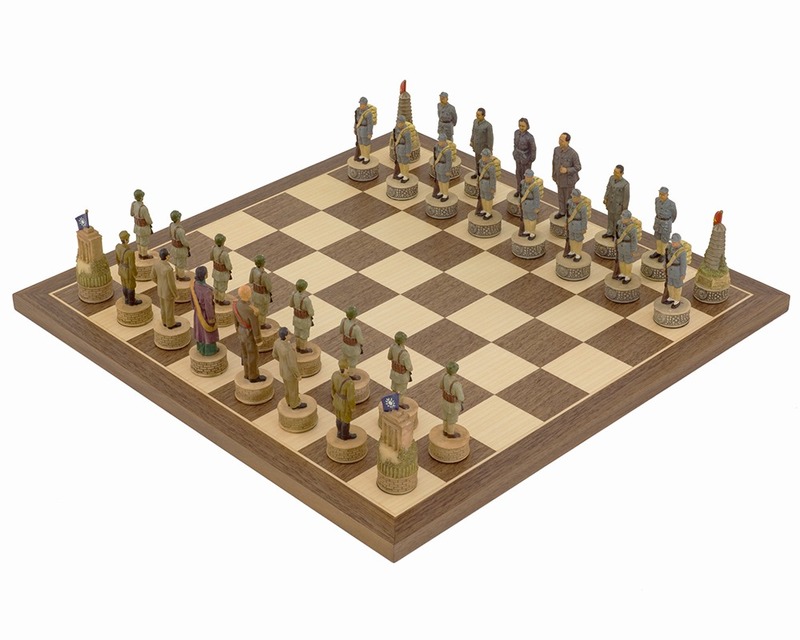 With or without a board, these pieces are a unique addition to any chess collection.